The DeSai Group specializes in helping enterprises grow their innovation capability. This includes innovation strategy consulting , innovation training and customer-centric innovation facilitation . The results of engaging The DeSai Group include improved visibility of market opportunities, compelling processes to incubate innovative ideas, and realization of net new revenue growth. The DeSai Group was established in 1983 as a minority-owned business. Our practical experience, diverse backgrounds, and applied research have enabled our team to be successful working across a broad range of industries globally. Discover how to become a world-class innovator with the guidelines, tools, and techniques found in Innovation Engine. "Innovation Engine will help you build a climate and culture of innovation. A must-read for every serious executive desiring innovation as a daily habit in his or her organization and to drive innovation execution." "Innovation is highly pursued, desired and, oh so often, bemoaned as lacking in large organizations. 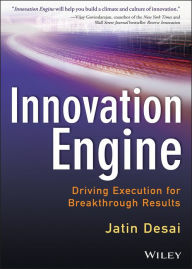 In this impressive book Jatin has pulled together a comprehensive approach to innovation - in itself innovative - clearly laying out the path from ideation to implementation. He has considered virtually every aspect of the organization - from individuals, to teams, to approach - in this passionately argued text. Well done!"